WHAT WE DO | Pennsylvania Dairy Princess & Promotion Services, Inc. 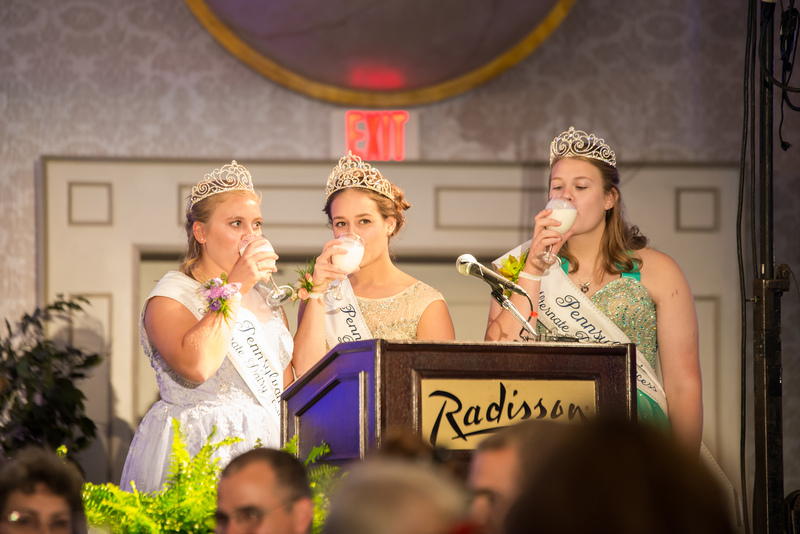 The Pennsylvania Dairy Princess and Promotion Program, Inc. (PDPPS) is a non-profit, 501(c)(5) that oversees county dairy princesses and junior representative royalty to promote the nutritional value and benefits of incorporating dairy foods into your daily life. Our grassroots dairy promoters are stationed in 45 counties across Pennsylvania. Additionally, three young women represent the entire state as our state royalty. This team of three will not only represent their home county, but also travels across the state as spokeswomen for the dairy industry. The state royalty team is crowned each September at our annual State Coronation. Our promoters speak at events and activities, give milk toasts, host interactive educational displays and share the importance of dairy foods and dairy farmers everywhere they go. PDPPS helps to ensure that our promoters stay up-to-date and receive training several times a year. DAIRY. Starting in 1956 with a Miss Milk Maid Contest organized by the PA Association of Milk Dealers and Pennsylvania Dairymen’s Association, the Pennsylvania Dairy Princess and Promotion Program has now grown to over 28 dairy princesses and over 200 male and female junior representatives promoting at a grassroots level. 1956: The Pennsylvania Association of Milk Truck Dealers and Pennsylvania Dairymen’s Association hosted the first Miss Milk Maid Contest. Contestants represented different milk marketing areas. 1968: The Pennsylvania Holstein Association takes responsibility of the program, and the name is changed to Pennsylvania Dairy Princess. The county dairy promotion program system that exists today was implemented. 1956-1971: The Pennsylvania Dairy Princess participated in a national contest sponsored by the American Dairy Association. The national contest was discontinued in 1972. 1970: The Bureau of Markets of the Pennsylvania Department of Agriculture begins to coordinate the program and employed personnel to travel travel throughout the state during the summer to educate consumers on the value of dairy products. 1972: The Pennsylvania Dairy Princess Pageant and Coronation was first held in conjunction with the September All-American Dairy Show. This tradition continues today. 1975: District coordinators were appointed to help increase program activities at the county level and serve as a resource to personnel. 1983: District coordinators established the program, as it is today with the name Pennsylvania Dairy Princess and Promotion Services, Inc. (PDPPS). PDPPS was led by an executive director to execute the PDPPS mission and oversee the office. Today: The program has 28 county dairy princesses and over 200 junior representatives at the county level, an incentive award program, training sessions and a state royalty team. PDPPS is led by a Program Director and Administrative Director who maintains the state office and works with a board of directors to execute the program’s mission.